There are 1,000 different known varieties of crabapple trees exist, according to the Missouri Botanical Garden, each varying in their shape, size and color. Their edible fruits range in size from 1/4 inch to 2 inches. Fruit colors range from yellow and orange to bright red and purple. The spring-blooming blossoms of the crabapple tree appear as double, semidouble or singe, and are seen in April to May. Crapapple trees are also noted for their brilliant fall leaf color, ranging from red and orange to purple and yellow. Crabapple ‘Weepcanzam’ (Malus 'Weepcanzam' Candied Apple) is a dwarf variety of crabapple that produces edible fruits. It grows 10 to 15 feet tall and wide and has a weeping, arching form and good disease resistance. 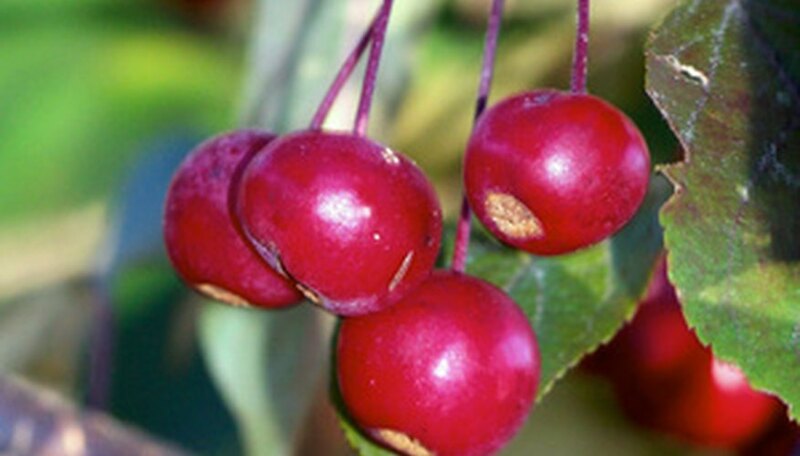 The red-to-pink flowers on ‘Weepcanzam’ gradually change to deep-whitish-pink and are followed by the 3/8-inch-wide, dark-red crabapples that mature in fall and continue to persist into winter. The 3-inch-long, spring-emerging, oval-shaped, dark-green leaves on ‘Weepcamzam’ have a wine-red tinge. Fruit on ‘Weepcanzam’ is edible and also attracts birds to the garden. ‘Weepcanzam’ grows best in full sun and well-drained, acidic soils, but is adaptable to a wide range of soils. Plant in USDA hardiness zones 4 to 8. Crabapple ‘Red Jade’ (Malus x scheideckeri 'Red Jade') is a variety of crabapple that has a weeping, spreading form. It grows 12 to 15 feet tall and 15 to 20 feet wide and produces showy flowers that attract butterflies to the garden. The 1 ½-inch-wide, spring-blooming, white buds on ‘Red Jade’ are tinged with pink to open up to pure white. Following the flowers are the bright-red, edible, 5/8-inch-wide crabapples or fruits that are harvested for crabapple jellies. The glossy, tapered, 3 1/2-inch-long leaves are medium-green and located on the cascading branches that “weep” close to the ground. ‘Red Jade’ grows best in full sun and well-drained, acidic soil. Plant in USDA zones 4 to 8. Crabapple ‘Profusion’ (Malus x moerlandsii 'Profusion') is a variety of crabapple that has a rounded, spreading shape and good disease resistance. It grows 15 to 30 feet tall and 20 to 35 feet wide, creating a commanding presence to the landscape. ‘Profusion’ produces 1 1/2-inch-wide, violet-to-red flowers that are followed by the bright-red, ½-inch-wide, edible fruit that matures in fall and lasts into winter. According to the Missouri Botanical Garden, the 3-inch-long leaves "emerge reddish-purple when young, turn bronze green during the growing season and finally turn varying but sometime good amber fall color." Birds and butterflies are attracted to the fruit. ‘Profusion’ grows best in full sun and well-drained soil. Plant in USDA zones 4 to 8.